Football, soccer as its known in states, is by far the most played and watched sport in the world and football has seen some of the greatest athletes over the years and decades. Every time a golden generation hang up their boots a new breed comes in and lift your heart. We take a look at 10 greatest footballers of all times. But before we start our countdown here are a few things which we considered in a player to be balled him as a true great of the game. 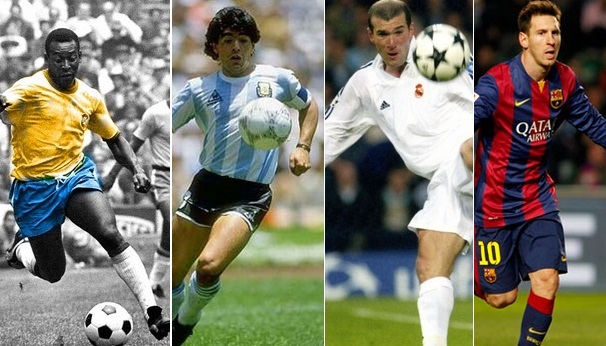 We take 5 different factors into account while ranking the all-time greatest footballers. Every factor has maximum 10 points. Talent/Ability: The first thing to consider in this kind of countdown is the talent a player posses. Sheer talent is what separate a good football from a truly great. Was he able to replicate his talent into the success on the pitch. A player might have all the talent in the world but it will be useless if he did not replicate it on the pitch over long period of time consistently. Success/trophies: Another important factor is success with the team, playing in most important matches and having a big impact in those games and competitions. There have been players who were not really flashy, or skilled like others but manage to win trophies throughout their careers for example some of the golden generation of Spanish national team who not only won 2010 world cup but two back to back European titles as well as success with their respective club teams like Barcelona and Real Madrid. Longevity: Another important aspect in assessing players is how long they played football at the highest/elite level. for example, Ronaldinho was probably the most skilled/talented player of all times but he failed to keep his career at elite level while players like Giggs and Paolo Maldini dominated two decades of their career. Fear Factor: When we talk about all-time great footballers mostly all of them dominated in big games. You see, you can win matches with average/good players but to win major competitions you need those big game players who are likely to have an impact when it really matters. Individual Brilliance: There are players who carry an average team single handedly to success largely down to their unique individual brilliance. Sometime its the opposite a great team/system help get the best of a player who other wise struggle in different team or system. Three time world cup winner with Brazil back in 1958, 1962 and 1970 and a true icon of the game, Pele is widely considered as the greatest footballer of last century and FIFA also recognized that with awarded him the best footballer of 20th century. His international career was upright success but his club success is debatable because he spent most of his career playing for native Santos and a few years in American league which was and still not considered a very competitive league. 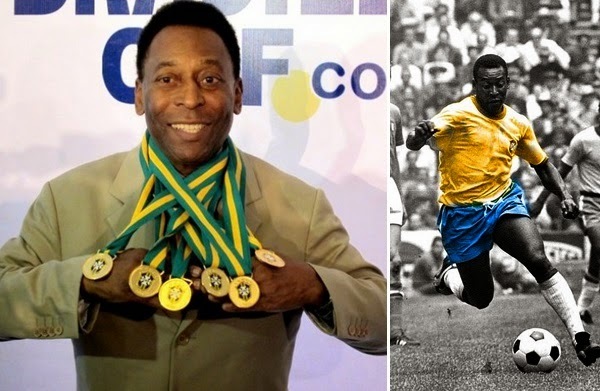 Although Pele won everything there was to be won with Santos, scored most number of goals (apparently the most by any footballer in history). According to unofficial statistics Pele has scored 1,281 goals in 1,363 games. He scored more than 100 goals in a year three times for santos in 1959, 1961 and 1965. Only downer in his career has been the fact that he never played in Europe when european football was alot more competitive than anywhere else in the world. But still his international success with native Brazil and unprecedented ability to score important goals consistantly truly made him the greatest football player of all times. Most football fans now consider Messi the greatest footballer to have ever played and more fans might join claim by the time Messi hangs up his boots. because still at the age of 28 he has several years left in him at the top of his game which is evident as after a lackluster 2014 he has turned up again in 2015 and currently have 53 goals to his name this season. Lionel Messi joined Barcelona at the age of just 13, first team debut at 17 and never looks back since than. He had a direct impact on all the success Barcelona had over the last decade and Barcelona are the most successfull team in europe having won the european cup three times since Messi has been a regular fixture in the team. Lionel Messi goals stats stand at 585 goals in 727 competitive matches, he is Barcelona’s all time leading goal scorer with 524 goals to his name he is also all time leading goalscorer of Spanish league having scored over 300 goals. Messi and Ronaldo are the top two goal scorers in Champions League history with over 100 strikes to their names. Goals are just one side of his impact on the team, when he is not scoring he is making and assisting goals with pinpoint though balls and lobs for his team mates. His international career with Argentina hit its peak in 2014 World Cup when he single handedly guided Argentina to World cup 2014 final but failed to win the trophy as Germany beat Argentina by 1-0 in extra time. But Messi ended up with Golden Ball (the best player in the tournament). Messi has also won 5 ballon dor awards, Messi has won 4 champions league top scorer awards, 5 times La Liga top scorer, three times European golden boot. He also finished runners-up twice with Argentina in the Copa America. After a brief retirement from International football he returned to guide struggling Argentina and ensure World Cup 2018 qualification with a dramatic hattrick in last qualifying game where Argentina had to win. By the time we update this article next year this time, Messi might have made even more history with both Argentina and Portugal and he might overtake Pele as they greatest player of all times. 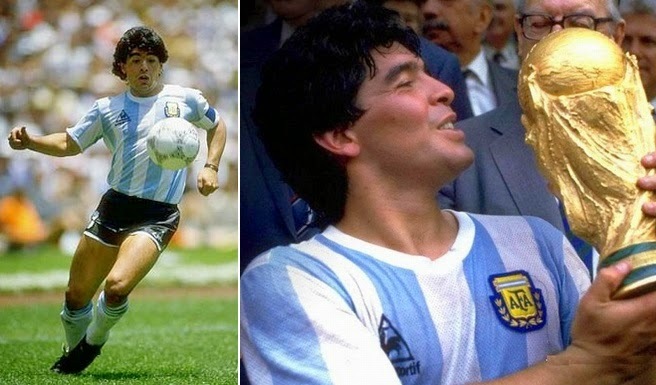 Probably the greatest dribble football has ever seen, Maradona guided a very average Argentina to 1986 world cup glory and scored two of the best goals in history of football in the process. Maradona’s name is often mentioned in the same breath as Pele when we talk about greatest soccer players of all times. Maradona unlike Pele played most of his club career in Europe with FC Barcelona and Italian outfit Napoli. When he transfered to Barcelona it was at the time a world record transfer fee but his time in Barcelona was short lived full of controversies and underachievement as he only manage to win a “copa del rey” trophy with Barcelona. He transferred to Napoli who were by no means title contenders at the time with the likes of Juventus, AC Milan, Roma and Inter Milan dominating Italian football. But his time with Napoli turned out to be success as he guided them to Italian Serie A titles in 1987 and 1990 plus couple of other trophies like Coppa Italia in 1987 and UEFA Cup (now known as Europa League) in 1989. Napoli fans loved him and he turned up Napoli week and week out with something special. Towards the end of his career he got into more controversies with drugs abuse, overweight which left a bad taste in mouth. But on the basis of his peak years and his sheer ability to dribble with the ball, he has to be up there as one of the greatest footballers to have every played the game. Just like Lionel Messi, Ronaldo might go up a few places in the greatest players of all times list by the time he hang up his boots. Currently 32 year old and still going strong at the top of his powers. Ronaldo is one fit athlete who started his career in Portugese team Sporting playing as forward who had pace and wide range of skills to bamboozle defenders. Manchester United saw the talent and signed him up at first opportunity. Ronaldo graced the premier league in 2003 and showcased his talent with outrageous fast step overs and other skill (often frustrating his team mates). But with in a couple of years he was matured and putting up top notch performances for United. He was part of a very successful era in United history where they won three back to back premier league titles and won 2008 Champions League final against Chelsea and won Fifa best player of the year award (Ballon Dor). In 2009 he moved to Real Madrid for a record-breaking fee $100 million. In Real Madrid his career really took off and he scored goals for fun. Moving to Spain meant he will be compared to other current great of football Lionel Messi on weekly basis and both have developed a super sporting rivalry where they are trying to ourscore each other every week. Ronaldo won his second Champions League title this time with Real Madrid and also won 2012-13 La Liga title with Real Madrid. Which was followed by three champions league crows in four years and another La Liga title in 2017. But he turned his somewhat disappointing international career into a success with incredible performances in European Championship 2016 guiding Portugal to their very first major international crown. Unlike Messi he can stake a claim to be one of the greatest players in international football and he now tops the scoring charts for his national team and that too by a margin. Zidane rose to fame with ability to control games in french football with Bordeaux where he spent 4 years before moving to Juventus in 1996 where his career really took off. Zidane scored those two beautiful headed goals in the 1998 world cup final against Brazil and won France their very first world cup title and he won the “golden ball” best player in the competition. In his very first season with Juventus he won the Italian League title and than helped Juventus win it again next season. Juventus reached final of champions league twice in Zidan’s first two years with the club but lost on both occassions. Than came the biggest transfer in football history as he moved from Juventus to Real Madrid in 2001. In his very first season Zidan finally won the UEFA Champions League title with Real Madrid and he scored a wonderull left footed volley from the edge of the box in the final against Bayer Leverkusen, the goal which is regarded as the greatest in Champions League. Zidan dominated Spanish football with Real Madrid. But his real impact was on the national team as he won UEFA Euro 2000 with France and than guided France to 2006 World Cup final where his french team lost against Italy on penalties. The final saw the most disappointing moment of Zidan’s career as he was sent off for headbutting Italian defender Marco Materazzi. Bechenbauer is one of the most gracefull footballers of all times, he was not only immensely talented but he revolutionized the game. Usually played as a centre back but it was his ability on the ball as he brought ball out of defense into attacks (known as libero) which made him success. He had hugely successfull career with both his national team (Germnay) and club team (Bayern Munich). He started his career with SC Munchen youth teams (city rivals of Bayern Munich) but he joined Bayern in 1958 and rest as they say is history. He became a force in Bayern team and Bayern become a force in world football. They won three back to back european titles 1974 to 1976. It was his time with Bayern when he innovated a new position called “Sweeper” playing behind the two central defenders and act as another line of defense while also had to licence to move the ball out of defense in counter attacks. Some of his goals were pure class as he started the move in his own half and finished it in the other. His international career was nothing but a success, reaching world cup 1966 final and winning the world cup in 1974 beating netherlands in the final with their “total football” brand. He also win European championship with Germany in 1972. He was not only a great player but a visionary who would go on to have massive success as a coach with Bayern and Germany as well. Towards the end of his career he played in MLS for New York Cosmos and helped popularize the game in the states. His last two seasons were in Germany with Hamburg winning another German league title. Di Stefano is widely regarded as the greatest Real Madrid player of all times, he scored in 5 consecutive European cup finals for Real Madrid winning all 5 of them in a era dominated by Real Madrid in 1950s. Stefano was born in Argentina and played his international football for three national teams (Argentina, Spain, Colombia). Although he scored 35 goals in 43 matches his international career never really got off to any heights because Argentina refused to play in 1950 and 1954 world cups while after aquiring Spanish citizenship he was eligible to play for spain who did not qualify for 1958 world cup. He played in qualifying matches of 1962 world cup but a injury prevented him to participate in what would be his last chance of being part of world cup in 1962. But with Real Madrid his ability to score goals from midfield helped the team to become one of the most successful of that era. Scoring 216 goals in just 282 matches for Real Madrid made him all time top scorer for the team at the time. 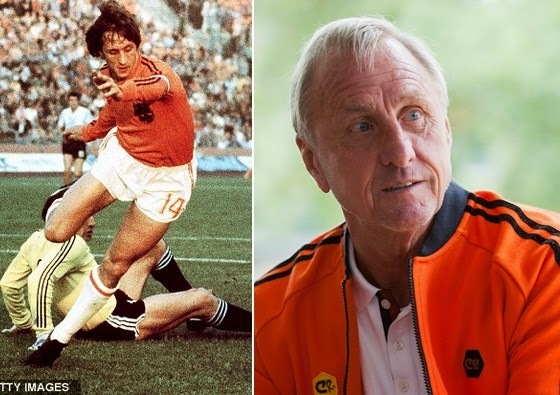 Winning 5 european titles where his record of 49 goals in just 58 matches stood for decades when Raul broke it in 2005.
dutch footballer Cruyff was one of the best attacking midfielder of his generation and just like Beckenbauer, Cruyff revolutionized the game. He was product of Ajax acedamy and played most of his career with Ajax winning 7 dutch league titles and 3 european cups in process scored 190 goals in 240 matches before moving to Barcelona. His time in Barcelona was not as successful as his time with Ajax but the ideas he brought to Catalan club kind of started route to success for later years. He guided holland 1976 world cup final where they lost against Germany in the final but not before Holland stunned the world with their new brand of football called “total football” where players could interchange positions and Cruyff was the great benefactor as he was equally good playing on the wings or in central attacking areas. He scored 33 goals in 48 international matches for Holland. Towards the end of his career he played two season’s in MLS before returning to netherlands and finished his career at ajax fierce rivals Feyenoord. One of the greatest french player, Michel Platini played most of his 15 year career in attacking midfield roles for Nancy, Saint-Étienne and Juventus. Played over 432 games scored 224 goals helping his sides to number of club honors. Highlight of his club career was 1985 European cup win with Juventus where he played instrumental role and he became the first player to win three back to back Ballon d’OR awards in 1983,84 and 85. He also captain France to 1984 European championship win which was their very first major trophy in international football. He was declared player of the 1984 european championship and also grabbed the top goal scorer award. He went on to manage France from 1988 to 1992 and later became “UEFA” president. This might come as surprise for some of the readers, but Xavi has been so successfull with both FC Barcelona and Spain that he has to be in every list of greatest soccer players of all times. Started in Barcelona youth teams back in 1998 he broke into the first time in 2002 when a struggling Barcelona were finding it hard to buy new players. At the start of his career he was more of a defensive midfielder but it was his touch and ability to control matches with superb compose passes which makes him stand out. He along with Iniesta and Messi were absolute tailor-made for Barcelona’s tiki taka style which was later adopted by Spanish national team. He is probably the greatest central midfielder of all times without any competition. When he was at the peak of his career Barcelona were winning trophies for fun here is his list of trophies. Ronaldo Fenomeno really deserves a spot on this list!! dude, you are not kidding. So many people just forgot about how amazing of a player he was. Top 5 all time at the very least!!! If you wanna say CR7 over Messi I won’t argue, and if you wanna put others in 7-10 I won’t argue (there are so many legendary players! ), but I am not budging on 1-4. NOBODY should be above any of these four amazing champions. How can you say that European leagues were stronger than Brazilian one in the 60s? All Brazilian players that brilliantly won 58, 62 and 70 WCs played at home! Santos and Botafogo (the best Brazilian teams at the time) played 2 or 3 tournaments in Europe every year and routinely trashed the best European teams. Those tournaments were not official, but were taken very seriously. After all, it was their only opportunity of playing against the world champions. European teams in the 60s had very few foreign players. In fact, there were strict limits on the number of foreigners, typically at most 1 or 2. Only a handful of teams, like Real Madrid and Milan, could pay enough money for top players to change their nationality (this meant that they would never play by their national teams anymore). So, the level of European leagues was much lower than nowadays, when they can attract the best players from all over the world. CR7 is like 50th best in the world. Messi is about third. Pele obviously should have more points than Messi not a tie. I’m generally ok with this ranking, but Ronaldo Luís Nazário de Lima has to be somewhere in the top 10. I’m not saying he should be #1 but he was a better player than several of the players on this list. What i find very sad is that people still recognise Maradona is a footballing genius, !!!!!! CHEAT he will always be to me, say what you like, it was win at any cost, how that decision was allowed to stand i will never understand, also if your going to pick a top 10 in world football, how could we not see Bobby Moore included, recognised by Pele as one of the greatest defenders he has ever faced, also no George Best !!! So i do appreciate some of these players are great, we should ask a question, how would they have coped playing the game with the old leather balls, and playing on surfaces which they would find impossible to play the modern passing game, very unfair to compare i know but you have to look at who has really had the greatest impact on the game and for the good of the game !!! -the time Pele played football the defenders were like “meh”, they were really weak, they never followed the striker to tackle the ball, if you disagree than tell me a strong defender of that time? I don’t think he exists. yeah gaucho played for a short time but…!